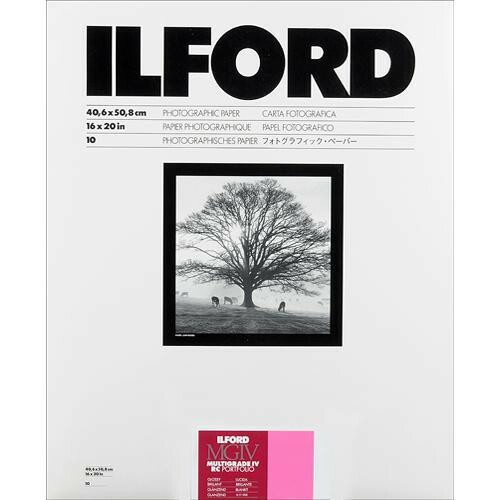 A versatile black and white paper that is well-suited to showcasing your work, this box of 10 sheets of 16 x 20" Multigrade IV RC Portfolio Paper from Ilford features a glossy 1K surface finish that is smooth and reflective in order to achieve noticeably deep black tones and a long tonal scale. Compared to the standard range of medium weight RC papers, this heavyweight Portfolio paper has a 250 gsm base for a sturdier structure that is ideal for exhibiting or for use in presentation books. Its bright white base tint delivers a cool-to-neutral image color, and it responds well to select toners, especially selenium, for increasing the effective print lifespan. As a variable contrast paper, it responds to seven full grades of contrast during printing, when using multigrade filters, and it is suitable for printing both conventional black and white negatives as well as chromogenic black and white negative films. Additionally, the paper can be processed using standard black and white chemistry in either trays or using machine processors. Box Dimensions (LxWxH) 20.6 x 16.6 x 0.8"